Review: Disney-Pixar’s ‘Incredibles 2’ Out Today on Blu-ray/DVD/Digital! The sequel to the classic animated film is finally available to own! 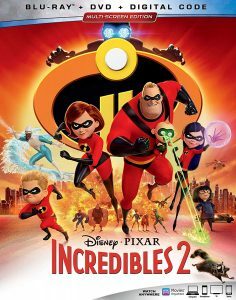 After 14 years, fans of The Incredibles (2004) got the sequel they’d been dreaming of this past summer. The entire cast returned, including director Brad Bird, to bring us the sequel we deserved – becoming a commercial and critical success. The film grossed over $600 million dollars in both domestic and foreign box offices, for a total of more than $1.238 billion dollars. Pick up everyone’s favorite superhero family today in 4K UHD, Blu-ray, streaming, and all of the other formats. Everyone knows how impressive animated visuals can be, especially in HD or 4K. This film is no exception, capturing the gorgeous art from the genius animators at Disney Pixar. Edna Mode is one of the funniest characters in the Incredibles films, and my only real complaint is that we didn’t get as much of her as I’d have liked. Well no more worries, because she gets her own mini-movie on the home video release of Incredibles 2! Find out just what happened while “Auntie Edna” was babysitting Jack Jack in this hilarious new short (5min 8 sec). What would a superhero home release be without a super amount of special features? This home release is packed with bonus content, which you will find on its own disc. Super Stuff (6min 36sec) – Hear from the creative team, as well as the cast, about all of the “super stuff” in Incredibles 2. Go behind-the-scenes as they discuss planning the sequel, reminiscing about the original film, and how it all came together. Learn about how they designed the sets, characters, action sequences, and much more! Paths to Pixar: Everyday Heroes (11min 40sec) – The cast and crew discuss how personal the project is to them, and where much of the story and characters came from. Find out their views on parenthood, family, and much more. Superbaby (4min 57sec) – One of the fan favorites (and a personal one for me as well) is Jack Jack. He is the MVP of the film in my mind, and this video is all about the youngest Hosted by Paige and Frankie from Bizaardvark, they go to the Pixar studios and learn all about the creation of the character. Learn how many of the special effects and animations were created for the pint-sized hero. Ralph Eggleston: Production Designer (2min 07sec) – Discover who Ralph Eggleston is, as he tries and explains what a production designer does. He’s worked on Toy Story, Finding Nemo, Wall-E, The Incredibles, Inside Out, Up – and now, Incredibles 2. Learn how he works with the other departments to bring everything together for the film. Making Bao (6min 02sec) – Go behind-the-scenes of the newest animated short, Bao. Writer/Director Domee Shi takes viewers on a journey through the story’s conception, production, and how everything came to life. An overview of the characters from the film. Watch them individually, or watch them all together. Interviews with the voice actors and creatives. Vintage Toy Commercials – Mr. Incredible, Elastigirl, and Frozone toy commercials. Character Theme Songs – “Classic” theme songs for Mr. Incredible, Elastigirl, and Frozone. Nearly 40 minutes of deleted scenes, with commentary from director Brad Bird. For fans who can’t get enough Incredibles, there is ton to dive into! Join the animators of the film for a unique look at the making of Incredibles 2! Dave Mullins, Alan Barillaro, Tony Fucile, and Bret Parker take you on a unique tour of the making of the film. Bring home Incredibles 2 Today on 4K, Blu-ray, Digital, and DVD!